Over nearly 15 years as a prominent figure in hospitality, Trevor’s ethics-directed approach has engineered the growth of his business in the area, making him highly regarded by clients who value his perspective. Dedicated to one of the top-producing residential brokerages in all of Seattle, Trevor is compelled by a relationship-focused philosophy that places his clients’ interests and passions at the center of his praxis and operates as a trusted advisor above all else. As a life-long Washingtonian, Trevor harbors comfort in the small town of Buckley actively serenading locals with his forever partner, Jessica. The two dedicate themselves to their family, son, and daughter. Carrie manages and oversees the business development and marketing at AO Residential and Pointe3 Real Estate. 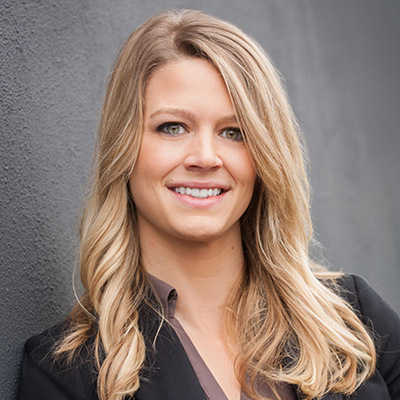 She uses her passion for connecting with the community, organizational skills and extensive marketing knowledge to formulate best practices with clients. 2009, she co-founded Seattle Living Room Shows and Seattle Secret Shows with her sister, providing live pop-up secret concerts across Seattle that feature the best local and national musicians in fun and unique settings. She currently continues to run Seattle Living Room Shows and Seattle Secret Shows during her “off” hours.